iMovie themes are one of the defining ways that makes iMovie the best option on the market for novice home video editing. The reason is that most people do not know how to use the intricate features of non-linear video editing to get the types of common editing "themes" you want, which in general means a visual and symbolic pattern that is relatively recognizable. iMovie themes allow a shorthand of allowing quick video setups that also have a nice polished appearance. Here is a look at some of the best free iMovie themes out there that you can employ. One of the most requested items is sports video editing software, mainly because sports is one of the most recorded things for home video producers. Whether it is just a little league game or your child's final championship, you often want to have the features that you see in professional games as a way of sprucing up this memory. This is actually very easy in iMovie '11 as you have a sports theme built right in, which makes it really one of the best options for free iMovie themes. 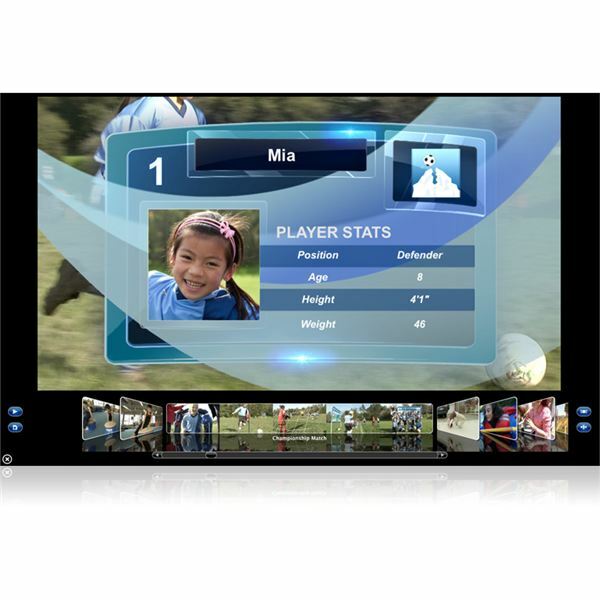 With this, you apply the theme and can then put in the specific video segments you want, breaking it up so that there are title cards for players and other sports-specific graphics. You can create slates for teams, scores, and even players stats in a way that really holds together the game for viewing. Another well-promoted iMovie theme that comes free with iMovie '11 is the news theme, and it is also one of the best. The reason that this comes in so well in iMovie is because news has a very specific style that is often difficult to mimic without a full service non-linear editing program and a lot of knowledge of graphics, just like with sports. Here you have the option of making quick and easy news reports complete with CGs, lower thirds, and picture-in-picture effects. This is great as we move more and more toward home video publishing and social networking where recording and broadcasting your own web news show is a common prospect. pictures framed by a visual representation of a scrapbook, which immediately makes you think about fragmented memories pushed together creatively by a common motif. When it comes to home video editing, home movies are really the primary form that the iMovie use is actually going to take. The scrapbook iMovie theme is a great way to not just add a little flavor to your project, but actually justify the non-linear structure that home movies often take.